CHP & CCHP | Kalor-Center Ltd.
3 pcs of JMS 6 gas engine with overall 7,2 MW Power and 8,2 MW Heat, 3 pcs of Thermax EJ40CTCU absorber with overall power 6,3 MW, 3 pcs of JCI PAC233L ammonia chiller with overall power 8,3 MW, 2 pcs of Viessmann Vitocross 300 hot water boiler with overall power 2 MW, Atlas Copco compressors. EPC contract with Power Plant operation. 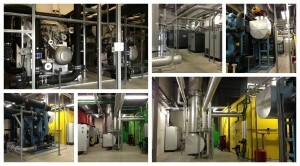 Installation of six JMS 620 GS-N.L/C type NG engine based CHP units with 21 MW Power and 25 MW Heat. Design and construction of mechanical , electrical parts and Instrumentation & Control system of Power Station. Installation and connection six 620 GS-N.L/C type NG engine based CHP units to 120 kV HV net. Installation and construction of connection of transformers to 120 kV’s net(to E-ON Székesfehérvár-West substation). Construction of high voltage electrical system and I&C system of Power Station. Manufacture and installation of the containerized natural-gas-engine based CHP block with Caterpillar reciprocating engine. Construction of mechanical and electrical parts, and instrumentation & controll of CHP unit. Installation of six CAT-type NG engine based CHP units with 12 MW power and 16 MW heat. Construction of mechanical and electrical parts. Civil works of the station’s building with a total area of 1700 square meters. Installation and erection of Instrumentation & Control of Plant. Installation of Wartsila type NG engine based CHP unit with 6 MW Power and 7,2MW Heat. Installation and construction of mechanical , electrical parts and Instrumentation & Control system of Power station . Installation of Caterpillar type NG engine based CHP with 1037 kW power, 1300 kW heat and 600 kW cooling capacity. Installation of Diesel engine based emergency genset with 900 kW power and boilers. Complex design ,licensing and construction, commisioning of mechanical, electrical and I&C parts of Facility. Installation one piece York refigerator absorber with 750 kW capacity. Complete final construction drawing and permission engineering and electric setup, building transformation implementation. Management technique mending and instrumentation. Installation one piece York refigerator absorber type 750 kW capacity.Complete final construction drawing and permission engineering and electric installation, building transformation implementation. Installation one piece DEUTZ 616 V 12K 510 kW electric capacity gas engine CHP heater block. Installation two pieces Caterpillar type 1000 SPE HEE 1037 kW/piece capacity gas engine heater block. Installation two pieces absorber with 800 kW refigerant capacity. Complete final construction drawing and permission, engineering and electric installation, management technique mending and instrumentation.